The Downbelow team of staff & professional diving interns both local & international proved that teamwork will prevail if enough effort is put in. It all started when our dive guides stumbled across a discarded net on one of the best dive sites in Tunku Abdul Rahman Park however this one was a little different as it was quite simply a MONSTER! We certainly believe it is one of if not the longest we have had the difficult task of removing but our awesome Downbelow specialist team were up to the job. 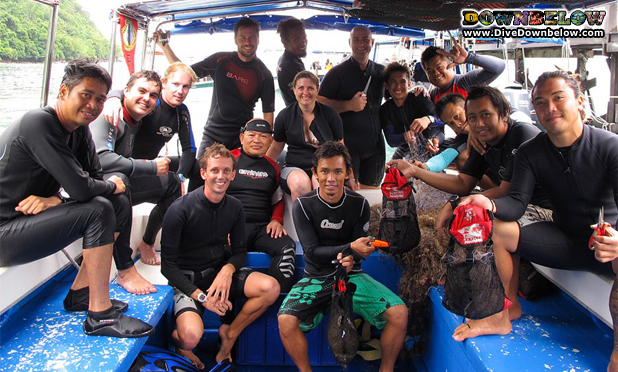 After a detailed briefing from Downbelow’s Managing Director and resident PADI Course Director Richard Swann, our team set off to do battle with the monster net & WE WON! Sadly as expected many marine life had already perished but we did rescue many critters that had miraculously survived entanglement but most importantly the timeless marine animal trapping machine has now been completely removed & the corals can breathe again. This is particularly an important experience for our new Divemaster trainees & PADI Instructor Development Course (IDC) candidates as they will take this knowledge along with them on their professional careers sharing the techniques required to stay safe whilst removing nets. If you are diving & discover a net report it to your dive operator in the hope they will act as we do. Check out the rest of the pictures in our gallery page.